Wow! 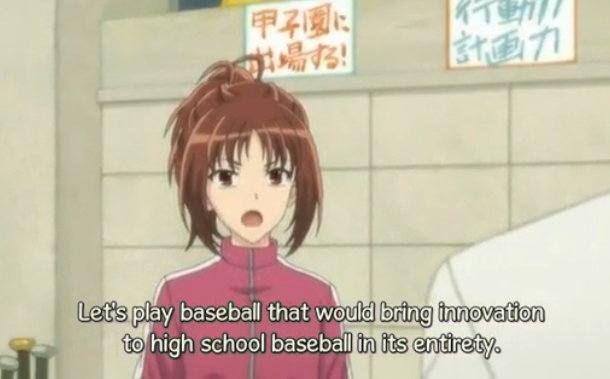 Moshidora 4 (What if a female manager of a high school baseball team read Drucker’s Management?) was very interesting on a number of levels. I only have space here to talk about a couple of them: 3 scales of innovation illustrated in this episode, and visual style. For me, personally, this was a very thought-provoking episode, so let’s get started! Nikai: Innovation on the personal scale. This episode was about innovation, and how! Innovation was tackled at three different scales, the personal, the organizational, and the social. It started with Nikai, a second stringer who makes a difficult decision to do what is best for the team, even though it comes with a personal price. The process we witness of Nikai coming to his decision is told with both reason and emotion. Many shows would build an entire episode around such a story, and lesser shows have milked similar stories for multiple episodes, but this is only the first of three types of innovation that were depicted in this very interesting episode. The second scale of innovation was organizational. In my last post, I said I would wish away the notion that Minami was now going to be working with all the other school clubs. That didn’t work. Minami still helps out the other clubs, but they handled it so well I can’t complain. The baseball team is used to assist the other clubs in ways that are mutually beneficial. Two good examples are the joint training sessions with the track team, and her asking the brass club to support the baseball team at games. By crossing club boundaries, Minami has spread growth (innovation) throughout the organization (Hodokubo High). Finally, and I might say, breath-takingly, the baseball team managers decide to try something extraordinary. Not only will they try to change themselves, but to change high school baseball itself! Here the innovation, if they can pull it off, will be felt throughout the nation. 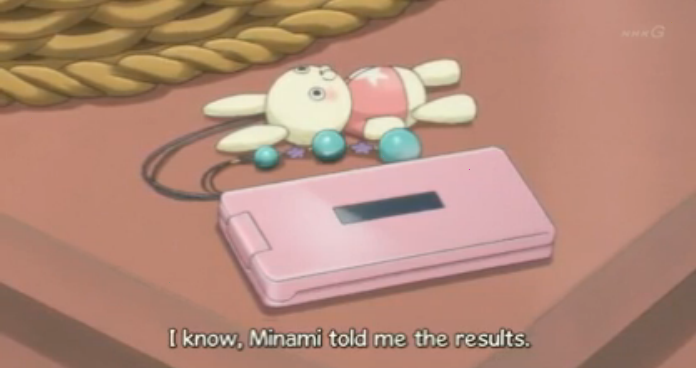 A couple episodes back, Hanners remarked that Minami was not a weak character. Asking the coach if he is willing to be the third legendary coach in the field of high school baseball is outrageous — outrageously awesome! I believe this scene exhibits exactly the kind of strength he was talking about. Sakura -- the cherry blossoms are just beginning to bloom. 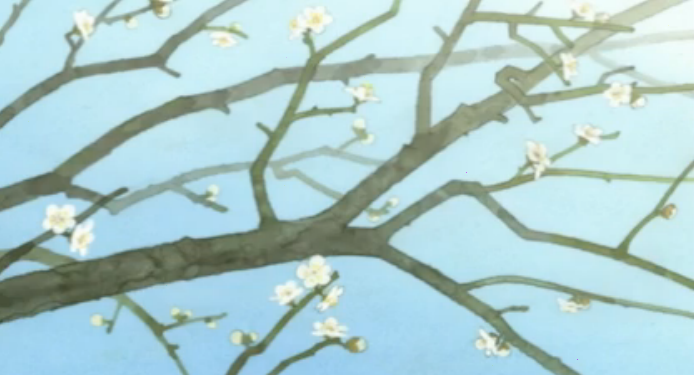 The first thing I wanted to point out was that there was a running depiction of cherry trees in this episode, from barren, withered trunks, at the beginning of the episode, to the buds’ first appearance on the tree (seen at the top of this post), to freshly opened blossoms. This seemed to be a metaphor first for Nikai’s frustration at his inability to move up to a starting position, then to his awareness that change would take more than long nights in the batting cage. 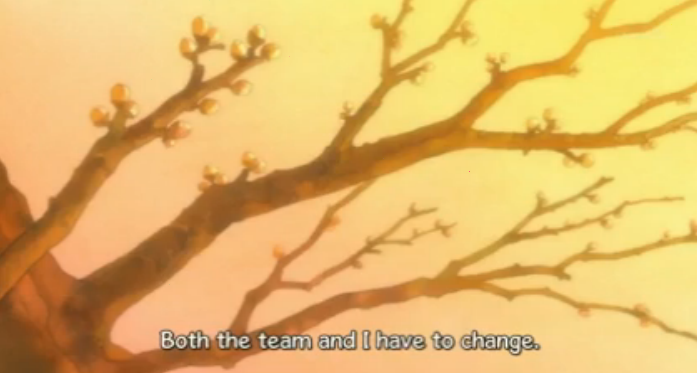 Finally the cherry blossom signals the beginning of a new cycle of growth and regeneration, not just for Nikai, but for the team as a whole. 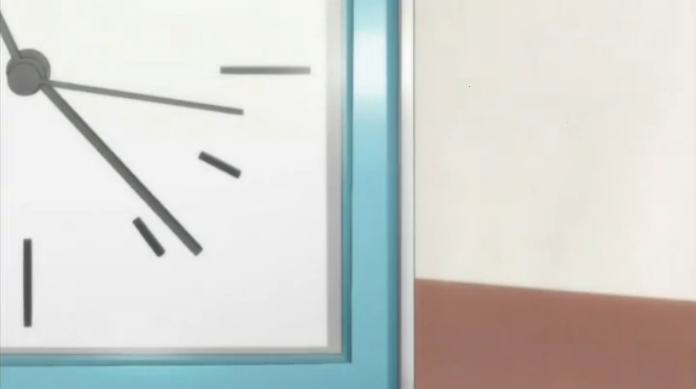 SHAFT/Shinboism #1 - close-ups of clock faces. 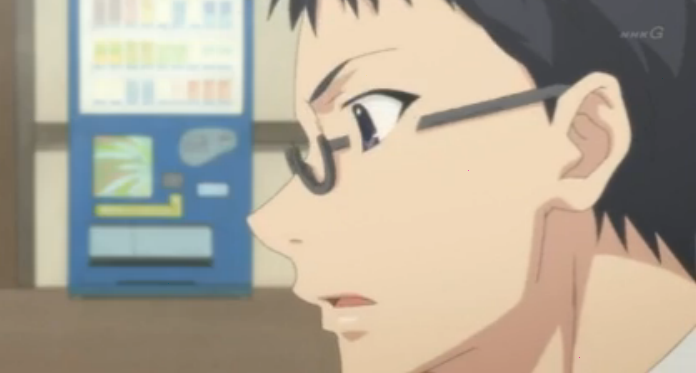 Secondly there were visual elements of this episode that looked like they were inspired by SHAFT/Shinbo. 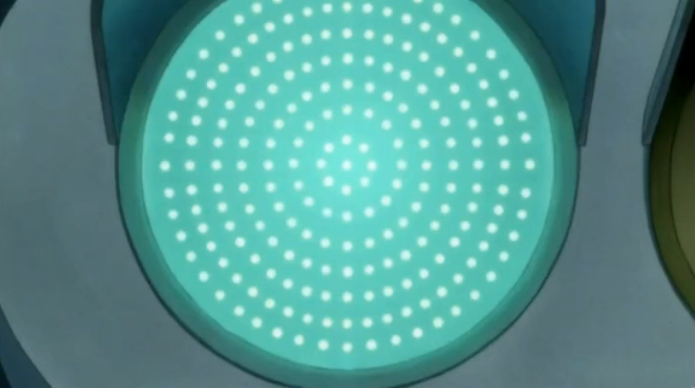 The first time I noticed it was in the hospital scene where there are two close-ups of a clock face. SHAFT/Shinboism #2 - illogical cuts to exterior details. 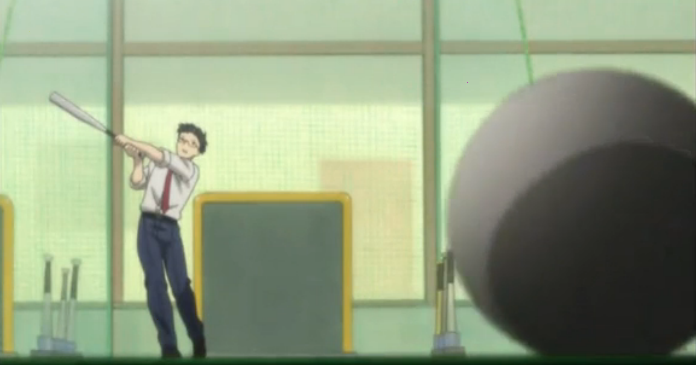 The second time I felt a strong SHAFT/Shinbo vibe was in the batting center scene. 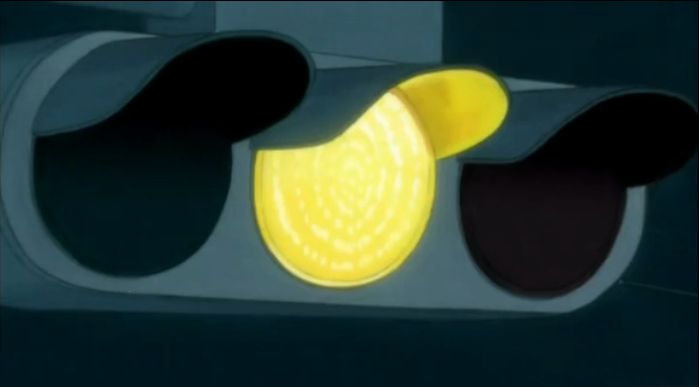 Here they kept cutting from the dialogue and action inside the batting center to a detail of a traffic light outside of the building. In some ways the traffic light here seemed symbolic of Nikai’s thought processes (similar to the shots of cherry trees as discussed above). You can also see an interesting use of perspective in the lower screenshot, which immediately followed the green light (another common feature of SHAFT/Shinbo productions). Finally I want to leave you with a couple still life screenshots. 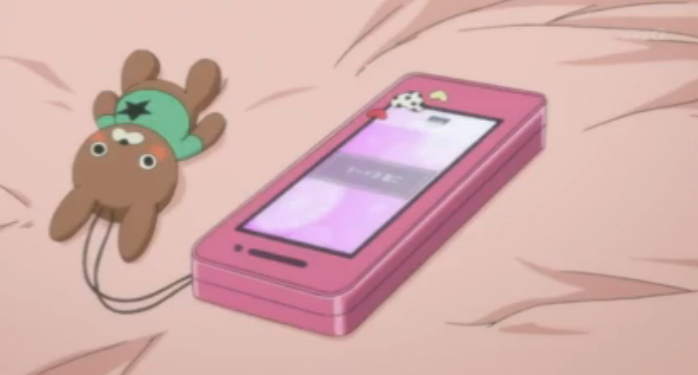 I mentioned in my first post on this series that there were some very nice deep background images (especially architectural ones), but there have also been great looking close-ups, including many illustrations of the two bunnies that Minami and Youko have on their phones.